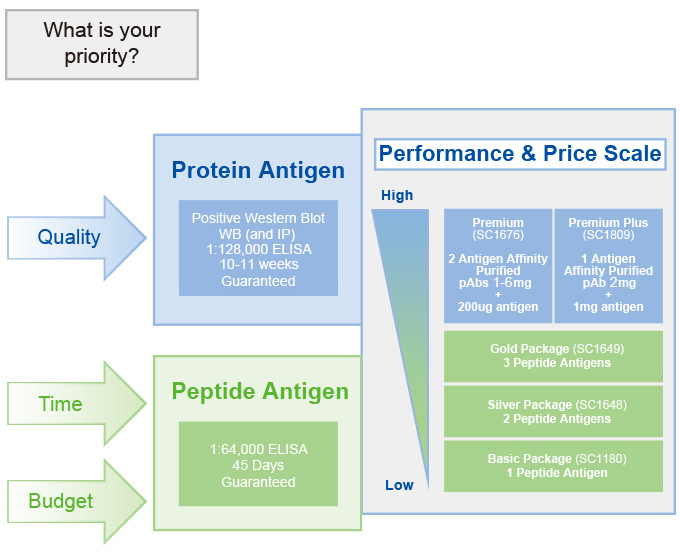 Our PolyExpress™ Premium package includes protein antigen production, the best choice for high quality antibody production. PolyExpress™ Premium or Premium Plus also guarantee delivery of antigen affinity-purified antibody 2 weeks faster than any other vendor. PolyExpress™ Basic, Silver, and Gold packages for custom polyclonal antibody production start with peptide antigen design using our proprietary OptimumAntigen™ design tool and finish with affinity purified polyclonal antibodies. PolyExpress™ peptide immunization services deliver custom rabbit polyclonal antibodies from sequence to antibody in just 45 days. Cost effective and comprehensive: pricing starts from $649 and includes antigen synthesis and purification! Fast turnaround time: delivery of purified custom polyclonal antibodies in as little as 45 days. Optimal immunization: Our OptimumAntigen™ design tool and intelligent Antigen Strategy increase specificity and affinity of antibodies. 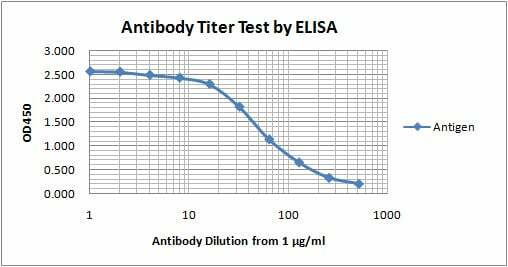 Guaranteed results: affinity purified custom polyclonal antibody quantities and ELISA titers of 1:128,000.